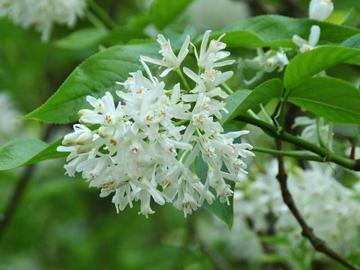 Strong growing shrub with stout erect branches and pinnate, glossy green leaves with 3 or 5 ovate-oblong leaflets. Panicles of small, bell-shaped, fragrant, white flowers in late spring, followed by the curious, bladder-like, two or three celled, greenish-white fruit. Any moist, well drained soil in full sun or part shade. Easy to grow. May effectively be trained against a wall. From seed sown in autumn, by greenwood cuttings in early summer or semi-ripe cuttings in midsummer.